Bro. Mark and Bro. Roy at the Brothers Symposium on March 25. Today we went to the 2017 Brothers Symposium at Notre Dame. 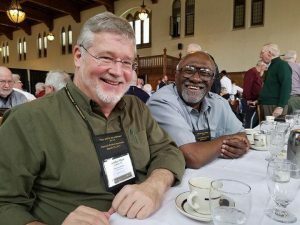 There were more than 160 Brothers from across the world in attendance, and it was a real blessing to meet other religious men from different orders and to hear their vocation stories. Meeting with other people who are living out this call to consecrated life is truly inspiring. We also had the privilege to hear from newly appointed Cardinal Tobin, C.Ss.R., Archbishop of Newark. He was among many fantastic speakers at the conference, and we all had a lot of fun celebrating brotherhood. Keynote speaker Bro. John Mark Falkenhain, O.S.B., called the vocation of the brother an “uncomplicated witness” to consecrated life. This resonated deeply within me, because I often feel called to serve the Church in a non-sacramental way. Especially in today’s society, the role of the brother is as important as ever because we need holy examples and witnesses in the Church. The whole experience was inspiring, informing, and edifying. I’m really looking forward to the future as a potential religious brother within the Congregation of Holy Cross.